The sixty square, double storey building has slightly more floor space in the downstairs area than upstairs. The project is currently in progress and will be completed shortly. The quoinings for this home will have a half cap at the top. This is achieved with a square column that has a column capital atop, this look is known as a capital dressing. A home in Francesca St, Mont Albert North that was previously under development is now proceeding. Decorative mouldings for the first level of the house will be completed in three weeks’ time with all mouldings manufactured and installed, creating a stunning finish to this home, within two months. The finishing Touch have recently manufactured and installed house mouldings to a home in Aitkens Rise, Golden Square in Bendigo. This double storey house of approximately 40 squares is of a post modern design with French Provincial influences. 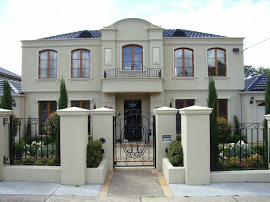 The decorative mouldings create a superb exterior finish to the home. The mouldings were used for arches and keystones as well as stringers around the columning under the arches. Windows have been heavily decorated with French provincial style window architraves, window sills and stringers around the windows and window sills. The Finishing Touch now offers an exclusive range of external mouldings in a smoother finish. Durable, strong and lightweight these new products offer an aesthetically pleasing alternative to our existing product range which demonstrates slightly coarser sandstone/concrete type finish. The mouldings in the new product range has a finish that resembles a finer grading sandstone or polished concrete look. The new product range includes high quality corbels, clasps, bosses, vents and other architectural decorative mouldings to match the existing range. More details on this range will be coming soon to our website. Mouldings have been used for centuries to decorate homes and buildings. Originally made from stone, stucco became a popular material and then terracotta. In more recent times render and concrete/cement materials were used. Interior mouldings were made of plaster and before the Victorian era decorative mouldings were made on site by using fingers on the wet plaster. The latest development in decorative mouldings are a lightweight mould made from high grade EPS polystyrene. The Finishing Touch range is manufactured from this lightweight material, which is then triple coated with a multi-part compound and further reinforced with a triple coating of sand for maximum strength and durability. Guaranteed not to warp, shrink or bend this style of moulding can be easily installed, free from the difficulties of traditional rendering and heavy concrete mouldings. A post modern single storey home being constructed in Studley Road, East Brighton has prominent exterior mouldings applied to the front of the house to create a stunning first impression. The three arches alone make a grand statement. Add to that eave moulds, parapet moulds, stringer moulds, window architraves, quoinings, key stones and under gutter moulds that hide the guttering and you have one very handsome exterior. The builders of this forty square home have used Finishing Touch house mouldings extensively through the building. 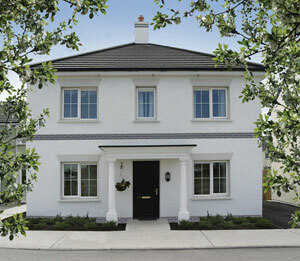 Another post modern house, this one a fifty squares double storey home has made great use of Finishing Touch mouldings. The parapet mouldings, window architraves, window sills and stringer moulds have added character and style to the construction. The suburb of Mont Albert North now boasts a fifty square, post modern home finished in classic house mouldings supplied by the Finishing Touch. The parapet moulding, quoinings and window sills have helped create a beautiful, classy home. Mouldings create an instant style and classic finish to a restoration. A project currently under development is the provision of window architraves for the restoration of a home in Mulduri Crescent, South Croydon. The Finishing Touch manufacture house mouldings and also offer an installation service. A home owner in Stanton Street, Doncaster has chosen to do his own installation of house mouldings manufactured by the Finishing Touch. The lightweight mouldings are easy to handle and a fixing kit is provided. However, an added benefit to home owners and builders who elect to use the Finishing Touch installation service is the seven year warranty provided. Whelan Master Builders selected the Finishing Touch to supply pier caps for a large period style fence on a property in Powlett Street, East Melbourne. 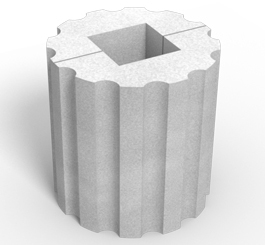 The lightweight mouldings are easier and quicker to manufacture and install than the traditional type. Pier Caps were chosen to match the existing piers. Window mouldings have proven popular recently with three houses being supplied decorative mouldings for windows. A house in Tasman Avenue, Nunawading has had twelve lengths of three metres each of window mouldings in the form of architraves with rivets manufactured and installed. Also three arches for the ground floor windows have been installed, adding further decoration to the building. Corinthian capitals were also added, creating ornate decorative corners and wall tops. A property in Mitchell Street, Northcote has had sixty lengths of window architrave mouldings manufactured and installed and another property at 195 Mason Street, Newport has had window architraves mouldings and two half column decorative mouldings manufactured and installed.Columns are usually manufactured in two halves to wrap around steel or timber posts. The Finishing Touch continue to be in demand, supplying lightweight mouldings for houses, buildings, gardens, fences and walls due to the quality of the mouldings and their quick turnaround from order to installation.